3D design and printing offer an almost unlimited range of possibilities as to what can be created and custom manufactured. Here at 3DPHACKTORY our in-house designers can take your sketch or photograph and create a custom action figure which then can be 3D printed in ABS plastic on our FDM printer. 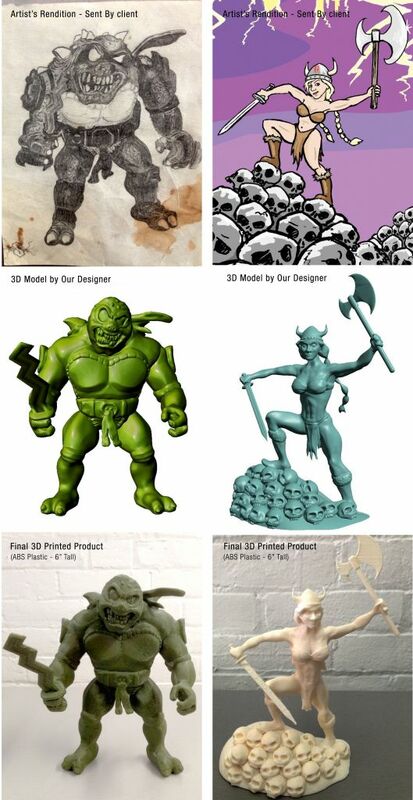 From start to finish we charge $1000 to design and print a custom 6″ tall figure. Perhaps you’re looking for a small scale character model for a project or maybe you’re interested in having yourself made into a miniature, the sky is the limit. Here are some examples from clients who sent us a sketch, which we used to create a 3D design and a 3D printed model.